A man in a field telling stories. No ordinary field. No ordinary stories. 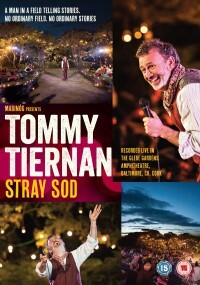 Tommy Tiernan, live beneath the stars in County Cork. In Celtic mythology a ‘Stray Sod’ or ‘Foidin Mara’ was an enchanted piece of grass whereby if a person steps on one, they will become disorientated and lost, even in familiar surroundings. It is said that wearing an item of clothing inside-out breaks the enchantment allowing the person to find their way again. ‘Stray Sod’ is also the title of Tommy Tiernan’s brand new DVD. Uplifting, joyous, inspirational, Tommy is a man who leaves nothing in the dressing room. There’s unlikely to be a more compelling stand-up out there today, with this show giving us all the sides of Tiernan, profound, dark, and silly too, his performance mesmerises in a way that is joyful, uplifting, inspirational and most importantly always breathtakingly funny. DVD World excluding Eire, North-America and Canada. VOD World excluding Eire, North-America and Canada. TV World excluding Eire, North-America and Canada. DIGITAL World excluding Eire, North-America and Canada.